I am incredibly proud of this pie, especially because it is one of the first things I’ve sat down and created all on my own. 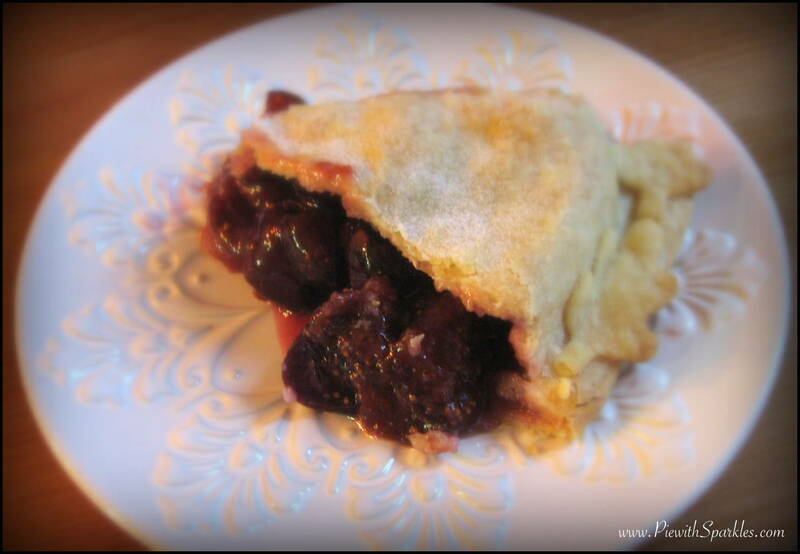 (I usually modify other recipes instead of starting with a blank slate…) While musing on what to enter in to the pie competition for the DC State Fair, several things went through my head: maybe something with Nutella or a variation on peach pie or one of fifty other ideas. But then, when flipping though one of my cookbooks, the idea of combining figs and grapes stuck in my head. 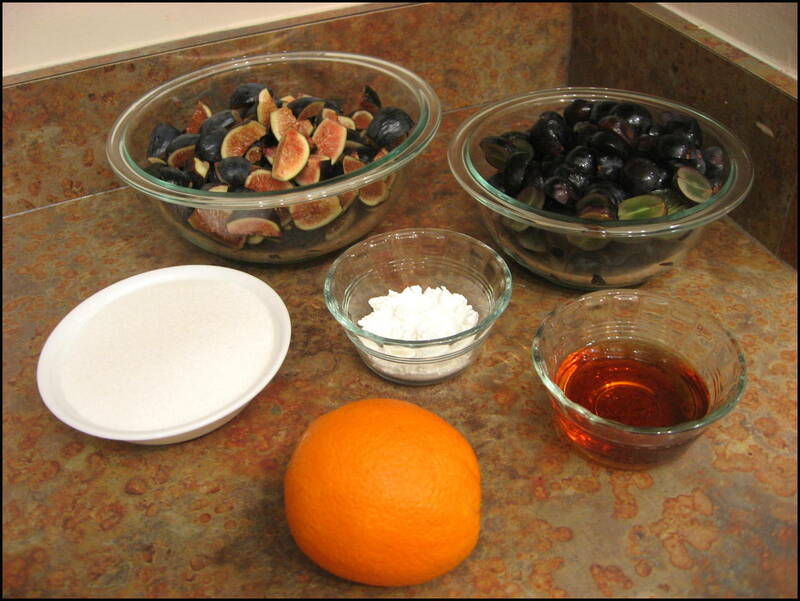 So I dug a little into the flavors that go well with figs and ended up with Cognac (brandy) and orange. I wasn’t quite sure how I felt right away. Cause the filling (compote at the time) is weird. It’s not what you would expect from a pie… Yes, it was strange, but damn, it was good. And those words just kept coming out of my mouth. It was like nothing I’d ever tasted before, but I just couldn’t stop eating it! The flavor of the figs is brought out by the cognac and orange, and the crunch of the grape adds a contrasting texture when cooked with the figs. Being by assembling your ingredients. Pre-heat your oven to 425° F. Place a cookie sheet lined with tin foil in the oven. 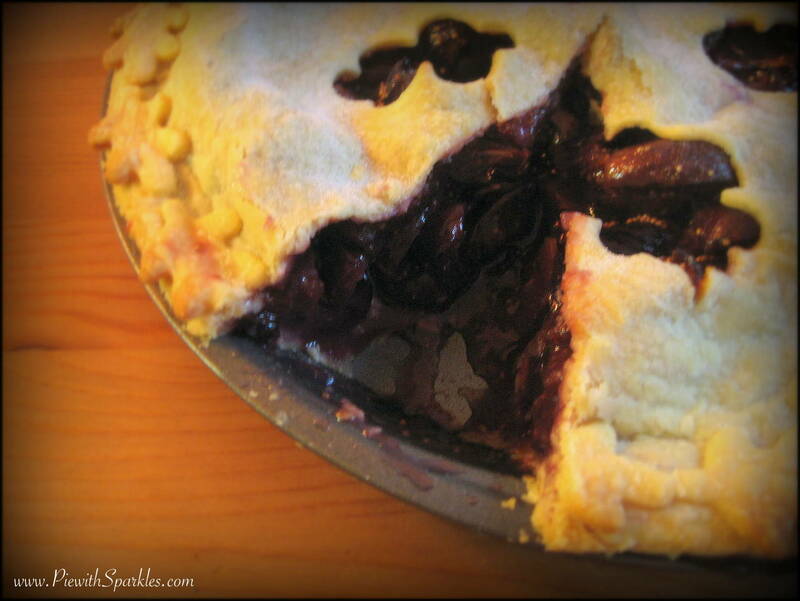 Quick tip: Baking your pie on a pre-heated cookie sheet will help prevent a soggy bottom crust. 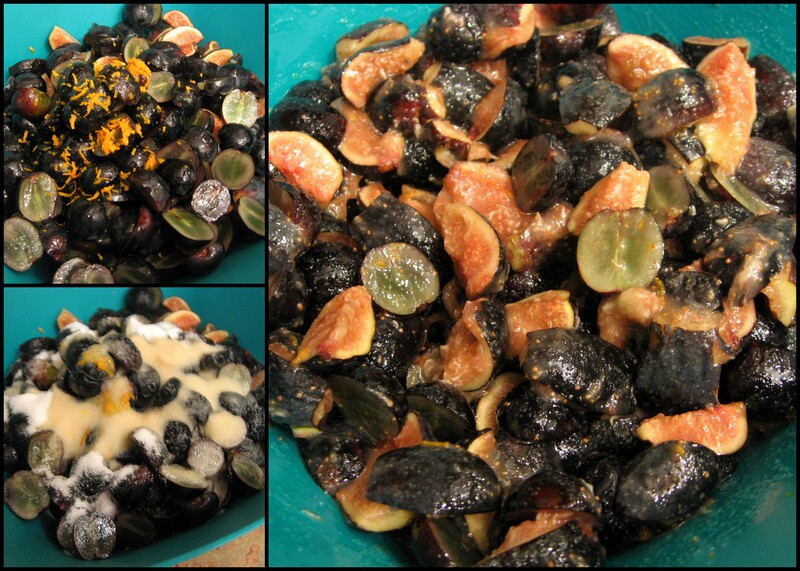 First, in a large bowl, combine the figs, grapes, and sugar. Grate the orange zest in to the bowl, and add the fresh squeezed orange juice. Mix the cornstarch and cognac in a small bowl, and pour over the other ingredients. Lightly stir together all of the ingredients, and set aside. For the crust, divide your pie dough in to two parts. Lightly flour your work surface, and roll out the first half of the dough for the bottom pie crust. Roll the dough to a uniform thickness, about 1-inch larger than the diameter of your pie tin. Gently press the dough in to the pie tin. Add the filling, including any accumulated juices, and set aside. Roll out the second half of the dough for the top pie crust. Again, roll the dough to a uniform thickness, about 1-inch larger than the diameter of your pie tin. For a decorative top, fold the crust in quarters and lightly press the seams. Gently unfold the crust. Using the seam lines as a guide, cut out four small leaves. Set the leaves aside. Use a small amount of water to lightly wet the seam of the bottom crust. 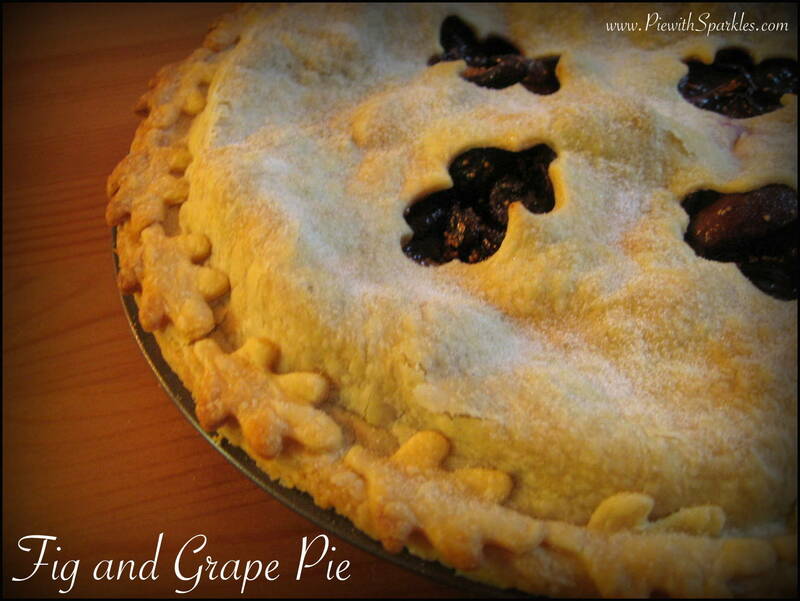 Place the top crust on the pie, and crimp the seam around the edges. Trim the excess pie crust from around the edges of the pie. Cut additional decorative leaves from the trimmings. 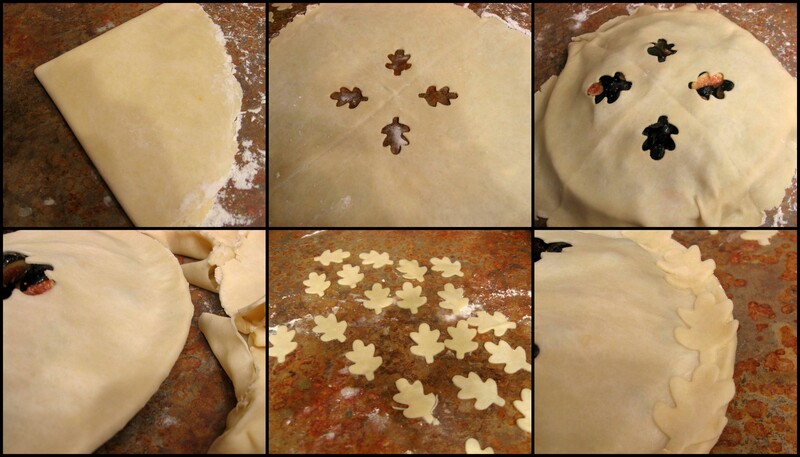 To adhere the leaves, lightly wet the top crust of the pie and press the leaves around the edge. 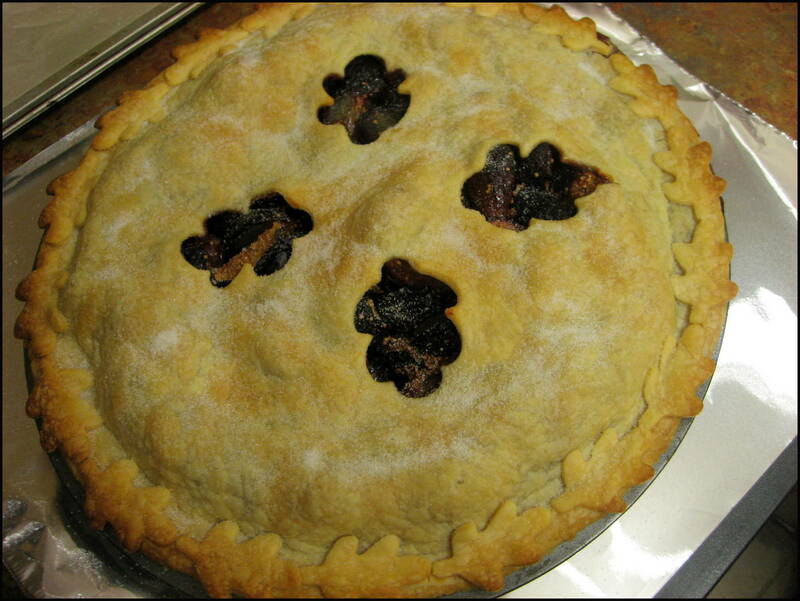 Bake the assembled pie in your preheated oven for 30 minutes. Then, lower the oven temperature to 375° F, and bake for an additional 30 minutes.